Have you ever paid attention to the things that belong to you? Things you fell in love with? Things you received as gifts? We have a personal connection with all the products selected by t o o k a and want to tell their story. Each place we present t o o k a has a story to tell as well. 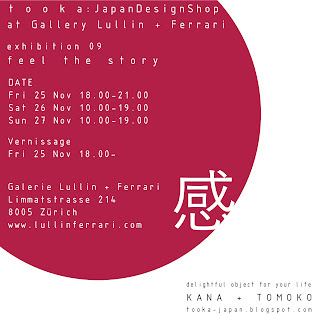 This year we have the pleasure of presenting our delightful products at the esteemed gallery Lullin + Ferrari in Zürich. The current exhibition "Trickortreater" by Benedikte Bjerre is on display and there will be a unique collaboration with t o o k a during three days. We welcome you to visit the t o o k a design shop selection within its creative atmosphere. We hope you enjoy shopping and look forward to seeing you!